Bandhan Bank was set up in 2001 to handle dual objective of poverty alleviation and women empowerment. It was previously a Non - Banking Financial Company (NBFC) but Bandhan Bank received its universal banking licence from Reserve Bank of India. The bank rolled out its services on 23rd August, 2015 (Founded). The bank started with 501 branches in all most 22 states in India which is highest branches of any private bank on the first day. The bank will provide funds to help and develop the Small and Medium Enterprises (SME). The saving interest rates have been fixed at 4.25% below Rs. 1,00,000 and 5% above Rs. 1,00,000. 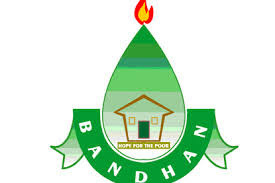 It is interesting to know that Bandhan was the only micro-finance institution that applied for a banking licence. Headquarters is located at Kolkata, West Bengal. Slogan of bank is "Aapka Bhala, Sabki Bhalai". Incidentally, Bandhan is the first bank to be set up in eastern part of India after Independence. MD and CEO of bank is Chandra Shekhar Ghosh.